You are here: Home / What is AAL? AAL means to live in a technologically supported surrounding, whereas this technology is sensitive and adaptive to the presence of people and objects. It reacts to to the actions of individuals and offers diverse services, to meet individual needs of the users. It is the aim to preserve individual freedom and Autonomie by supporting, improving and prolonging the self determination of individuals. Considering divers areas of quality of life, AAL solutions can contribute to meet some of the big challenges of demographic change and to make use of new opportunities – this is especially targeted to the health and care sector. The core target group of AAL technology is the ageing individual person in all individual life situations as well as care and living situations. Next to AAL-offers in the section of health, wellness and nutrition, the AAL topic refers to application areas such as security, information & communication, home automation as well as connection to local service providers. This holistic approach also applies in the context of Smart Homers – Smart Services. 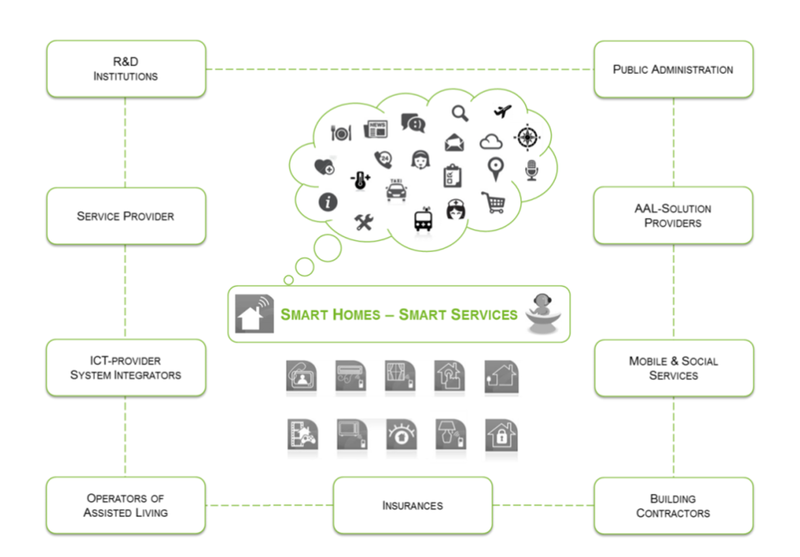 This is why AAL solutions enrich the service offer of Smart Home concepts to a meaningful extent. AAL will be important to open up new possibilities (benefits and potential future benefits) for end users.